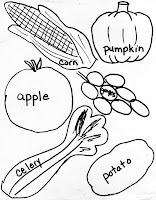 As we finish up our good foods unit and start Thanksgiving I always think it's fun to introduce the children to a cornucopia. I don't know,maybe I just fancy the word. Since the cornucopia has lots of good food in it, it ties in nicely with good foods. 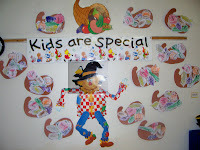 Since it is a popular Thanksgiving decoration, it helps us with the introduction. I did find out this week that this class needs a LOT of scissor work. This is one of those activities where I try to let them do all the cutting--WAS NOT happening this year. I have had scissors out during free time all year, but not in an organized way--they are real good at fringing everything. So anyway, I have a cornucopia basket cut out for every child. If you have older children, you can give them the pattern and allow them to cut it out. I also have a paper with different foods on it. 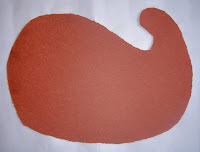 I made the paper myself by tracing food shapes from a puzzle- so yes it is homemade. To reinforce our colors, I have out the crayons and ask, what color is an apple? Then I ask them to find the correct crayon and color. I do that with each pieces out food. After all the food is colored, I give them the scissors and ask them to cut the food out. I usually cut the food "apart" so they are not dealing with a full piece of paper, then I have them cut around the food--I did a lot of helping with this. When everything is cut out I let them glue the food in the basket. Bec ause of the cutting, this project can take a little longer than normal--just an FYI. 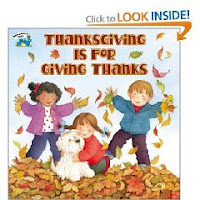 The book I read today was "Thanksgiving is for Giving Thanks" by Margaret Sutherland, illustrated by Sonja Lamut. It is a very basic story of children giving examples of things they are thankful for. I like to reread this story when we make our Thankful Turkey to help refresh their memories of the many things we have to be thankful for.